The Big Sky Conference is privileged to announce that the University of North Dakota and Southern Utah University have accepted invitations to become core members of the Division I conference. Both institutions received formal invitations from the league Friday, Oct. 29, advancing a process that began when the presidents of the nine current Big Sky Conference core universities approved expansion plans at their annual fall meeting on Oct. 20. Both institutions will officially join the Big Sky on July 1, 2012. The Big Sky Conference is also on the verge of announcing the addition of the University of South Dakota as a 12th core member. End of summer — welcome back! Were you out on an Alaskan fishing boat all summer, spent all your spare time scheming how to get your share of the “stimulus” dollars, busy hosting the Tony Awards, or just otherwise lost track of UND athletics during the summer? I’ve thrown together a quick cheat sheet of UND summer athletics happenings you might have missed. Josh Murray declared academically ineligible. Like many other sports, football got new uniforms (photo from fightingsioux.com). See more on UND’s new identity branding below. UND recently announced that it is traveling to Montana for a game in 2010, with a return game expected in 2013. With an eye on Montana’s proclivity to take the home game then buy out the road game, UND secured a $100,000 buyout clause. This topic is still getting lots of play in the scheduling forum thread. It’s not news, but the talk of UND football this summer has definitely been the Labor Day weekend season opener at Texas Tech (Sept. 5 at 6pm CT). UND’s D-I transition mate, the University of South Dakota, was admitted to the Summit League (USD release) beginning in 2011-12. Summit commissioner Tom Douple had, somewhat surprisingly, previously weighed in on the UND nickname controversy, asserting that the conference would not take a look at UND until the controversy is “resolved” (the State of ND settlement with the NCAA apparently being insufficient). The battle over UND’s nickname is coming to a close, one way or another. On May 15, 2009, the N.D. State board of Higher Education unanimously decreed that UND must eliminate the Fighting Sioux nickname by Oct. 1 unless it secures 30-year agreements from the Spirit Lake and Standing Rock Sioux tribes granting approval to continue using the Fighting Sioux name. I kind of threw this list together by browsing the forums and news headlines. What did I miss? Author Jim DahlPosted on August 21, 2009 August 21, 2009 Categories Football, Men's Hockey, UND AthleticsLeave a comment on End of summer — welcome back! Author Jim DahlPosted on October 26, 2008 October 26, 2008 Categories Football1 Comment on A need to get defensive? Please include your name and hometown, and Coach Mussman might answer your question live on Sioux Sports Extra! You can watch on WDAZ if you’re in the right area, or online by clicking on the link. Sept. 6 St. Cloud St.
Sept. 18 @ Idaho St. The first year of the transition is the toughest to schedule, because UND is considered a “non-counter” for teams with aspirations of making the I-AA playoffs. The inevitable comparisons with first-year schedules for other recently transitioned schools have arisen, and bincitysioux came through again with a breakdown of 1st year D-I schedules for current and former Great West members. While every football fan should have been hoping for a better schedule, this is on par with what other transitional teams were able to put together. While comments here are always welcome, you might as well just head over to the UND 2008 Schedule thread and check on the latest. Author Jim DahlPosted on February 29, 2008 Categories FootballLeave a comment on 2008 Football Schedule pending? 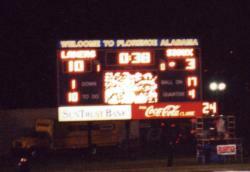 2004 – playoff loss at Pitt St. The Sioux were down 10-14 with 38 seconds left in the game. UND was on its own 41 and facing a fourth down. A missed tackle resulted in a pass to the Sioux tight end completing for 58 yards, setting the Sioux up with a first-and-goal and seconds on the clock. Jed Perkerewiez punched it in for the Sioux, sealing UND’s first national championship. I was still pruning messages after 60 days and SiouxSports.com didn’t have a football forum yet. In fact, I think I added it due to the upsurge in interest on the site following UND’s first football national championship. Ugly weather and staunch defenses on both sides resulted in very little offensive production this game. The deciding, and only, touchdown came after GVSU returned a UND fumble in the red zone. GVSU drove to the 1-yard line on the opening drive, but had to settle for a field goal in what would turn out to be the only points of the half. UND drove to the GVSU 7 to open the second half, but the GVSU defense returned a turnover to the UND 20, setting their offense up for the only TD of the game, giving GVSU a 10-0 lead. The Sioux again drove into Laker territory, but missed the 43-yard FG attempt when the kicker slipped in the mud. On subsequent drives in the fourth, the Sioux missed a 46-yard FG attempt and nailed a 35-yard one. GVSU missed a 43-yard attempt with about 4 minutes remaining, leaving UND one last chance. In the game’s final drive, the Sioux were hoping to repeat their 2001 performance as they drove to a 1st-and-10 at the Grand Valley 17. However, the GVSU defense held and GVSU took the honor of having won two of the last three championships instead of UND. Notably, GVSU did not have home field for any of its post-season games in this championship season. Between the 2003 and 2004 seasons, the NCAA realigned Division II, putting GVSU and UND in the same region. That meant we had seen the last GVSU vs. 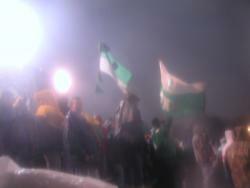 UND national championship game, and that the two teams would instead meet in the regionals. The first such meeting occurred in Grand Forks, as GVSU had lost two games in the regular season. GVSU led 9-3 going into the fourth, when the scoring seesaw began. A 34 yard drive culminating in a Sioux field goal was answered by a 76 yard Laker drive for a TD, bringing the score to 15-6 GVSU (missed PAT). The Sioux answered with a 68 yard TD drive, the first UND TD against the Laker defense in seven quarters, leaving the Lakers with a 15-12 lead (on another missed PAT). The game was decided when UND sacked GVSU’s quarterback and forced a fumble, setting up a UND possession that would lead to the game-winning TD. In UND’s first trip to Lubbers Stadium, GVSU scored TDs on consecutive drives of 85 and 69 yards with the wind in the 2nd quarter. Those two scores proved to be the margin of victory, as the Laker defense kept UND out of the end zone, including a four-down stop against the Sioux on a 1st and goal from the 3. The Sioux were plagued by a slow start, as GVSU posted 208 yards of offense in the first half, while UND posted only 105. UND ended the game with 332 yards of total offense to GVSU’s 286. I proposed early on that we played the wind wrong, while others noted bigger problems. The bottom-line to this game is GVSU came out ready to play and used the wind advantage to run up the score to 27-0 by the end of the first. UND clawed back, scoring 20 points in the remaining three quarters, but also left plenty of points on the field. I wonder what UND could have done if it GVSU hadn’t had the luxury of defending a 27 point lead for the final three quarters, but there’s no doubt that the team that played better football won this day. Well, Jim wanted to get an opinion of a Grand Valley State University Laker fan on the upcoming football game between GVSU and UND, and just general thoughts on the quick little rivalry, and well, I figured I might as well give it a shot. All in all, it has been a flat out blast playing you guys and it’s just not going to be the same next year looking at the playoff brackets without North Dakota in the mix. So, here are some thoughts on some of our past matchups, and a little look back at it all. Sure the 2001 NC game really hurt for us when we’re up with like a minute left and then GV blitzes and misses that tackle that lets the Sioux make that long gain in which leads to the go ahead score for the Sioux. That really sucked, and well, they would pull my GVSU fan card if I didn’t mention the fact that if Curt Anes was healthy, the Lakers would have put up a lot more points on the Sioux defense that day. 2003, now that was a game there. Back and forth all day, and us poor Laker fans having visions of 2001 running through our minds on that last UND drive. Luck for us, we get that interception to seal the win that year. 2004, Well, this is the year when I started to have a low opinion of the NCAA when they shifted the GLIAC west into the Northwest region along with the NCC. If there’s one thing I’ve learned from this rivalry, is that they’re all a bunch of bums and idiots down there in Indianapolis. I could say worse about them, but I’m sure you all have an even lower opinion of them than what I do. With that shift, it ruined a great possible championship game matchup and left it at best, a regional final game. Not what this matchup deserves, but eh, I guess we were spoiled in just meeting up twice in Alabama now weren’t we? Still, it was a pretty close game, with the Sioux getting the better of the Lakers that time. 2005 and 2006, The Sioux travel to Lubbers both times and well, now it’s pretty well established that post season matchups between our two schools are destine to happen for as long as both of us are in Division Two. The Lakers managed to get the better of the Sioux both times out on the icy windswept field of Lubbers stadium, but they were both games were everybody’s mettle was tested. No sissy paddy cake games like what some other regions are like. Both were some hard hitting games where the snot was sent flying on both sides and a few players wanting to get a license plate number of that truck that hit them. And so, it brings us to 2007. And well, as I’m sure you’re all aware of, it will be the last time the Lakers and Sioux will have this donnybrook in the playoffs. The Sioux will be moving on to D1, and well, us here in Laker land will be sad to see you guys go. But for the Sioux, it’s a wise move for them, given your facilities, fan base, and general support you guys have in North Dakota. Plus, that Ag College to the south going up to D1 did put a lot of pressure on UND to move up. All in all, you guys will be missed by Division Two. You guys were a great example of what D2 should be. UND has been great competition for GVSU and made the Lakers raise their game up. For those of you that do make it to the game, I’ll see you out at the Tailgater before the game. Just ask around in the Irwin Lot for the one they call the Monster. For those of you unable to make it, you’ll probably get to see me on TV.